Originally published by Stevenson, Inc., this practical resource offers strategies for nonprofit organizations to connect with more donors, members, and volunteers through their websites, and presents examples of successful website features from a variety of nonprofit organizations. It’s filled with tips on strengthening relationships, reaching a broader audience, and driving traffic to a website. 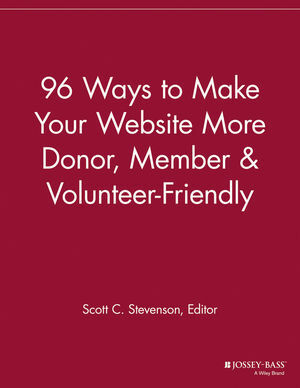 Scott C. Stevenson is the editor of 96 Ways to Make Your Website More Donor, Member and Volunteer Friendly, published by Wiley.